Tour of Park Güell + The Holy Family - Visit the most famous park and cathedral in Barcelona on a unique guided tour. 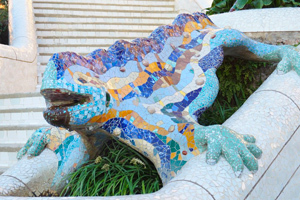 Visit two of the most sensational locations in Barcelona in a unique tour! Are you looking for the best way in which to visit some of Barcelona's most famous attractions on the same day? With the Tour of Park Güell + la Sagrada Familia, you will be able to visit two of the city's most incredible attractions in one day, without having to worry about transportation or tickets. By booking a shared tour, in addition to the convenience of the fast-track access at both locations, you will also have the benefit of an expert local guide at your side. For a cost of just €76.00 per person, your tickets will include the "Skip the Queue" feature together with a guided tour lasting 4 hours and 30 minutes! Book your shared tour now by filling out the booking form on this page. The tour includes entry and a guided tour of two of the most famous attractions in Barcelona, the Basilica of La Sagrada Familia and Park Güell. Both works are the result of the extraordinary vision of the modernist architect, Antoni Gaudí. The tour also includes transfers on board a comfortable bus from the park to the basilica (about 30 minutes). The visit to the park will be the first stop on the tour and will last about 1 hour and 45 minutes. It includes a visit to the towers but in order to visit them, it is possible to book a private tour on the page: ENGLISH GUIDE. We recommend that you don't wear clothing that is too skimpy or uncomfortable shoes so that you can walk around the park in comfort and in order to show some respect when entering the interior of this world famous church. The tour is shared, in other words, there will be other visitors in the group with you and the guide may well skip between a couple of different languages. (This Tour is available in Spanish & English). The bilingual guides are professionals who know how to make a visit fun and also appealing to children. In addition to this, they are always happy to answer any questions you may have and to reveal all the most intimate secrets of these architectonic masterpieces which have become symbols of the city of Barcelona. The whole tour will last approximately four and a half hours and at the end of the tour, everyone is free to wander around the interior of the Sagrada Familia to take photographs and enjoy the extraordinary atmosphere provided by the thousands of lights inside this iconic building. Upon receipt of payment, you will receive an email confirmation that you will need to print off and hand over on the day of your visit.